*Callumae is a Vitiligo Remedy designed to help get rid of white spots on your skin. Use in conjunction with light therapy (or natural sun light) to help get the most repigmentation to your skin. It's hard for anyone not suffering from vitiligo to understand the emotional and psychosocial havoc this condition wreaks upon the sufferer. The change in appearance caused by vitiligo affects various levels of emotional well-being, especially when the condition results in visible white patches on the areas of the body involved in normal, day-to-day interaction. Some individuals with vitiligo suffer from embarrassment, shame, depression, and fear of rejection, both socially and professionally. As there is no definitive cure for vitiligo, Progressive Health has developed Callumae to provide all sufferers with another effective coping strategy. Our unique formula helps patients to enhance their physical and emotional status by giving them confidence in knowing that their nutritional needs for the condition are being met. Whether used alone or in combination with your current treatment regime, our vitiligo remedy Callumae may work to slow the progression of Vitiligo and help restore normal skin pigmentation. Although researchers have yet to establish a definitive cause of vitiligo, there are several different theories that exist. First, a number of specialists suggest that people with vitiligo develop antibodies that seek and destroy melanocytes in their bodies. A second theory infers that the melanocytes destroy themselves as a result of abnormal nervous system functioning. Finally, a large number of experts believe that the greatest determinant resides in one's genetic susceptibility. 12% of families who have one person with vitiligo also have another family member with the condition. Secondary factors, including environmental and emotional stressors, are thought to play influential roles in the onset of this condition within genetically susceptible persons as well. 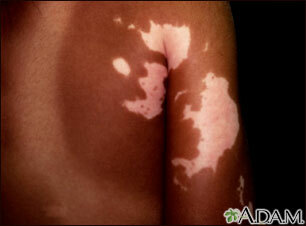 As its cause has yet to be determined, the risk factors for vitiligo are extremely difficult to assess. Approximately 1-2% of the World's population suffers from this condition. Vitiligo affects all races, ethnicities, and both sexes, equally. One-half of vitiligo sufferers will experience some pigment loss before the age of 20 and 95% of patients will develop the full condition by age 40. Exposure to phenols, found in various hair coloring products, photography chemicals, and household stains, may trigger vitiligo in genetically susceptible individuals. These may include hyper-, or hypothyroidism (overactive or underactive thyroid gland), adrenocortical insufficiency (the adrenal gland does not produce enough of the hormone called corticosteroid), alopecia areata (patches of baldness), and pernicious anemia (low levels of red blood cells caused by failure of the body to absorb vitamin B12). Vitiligo's impact on the sufferer is not just cosmetic. The condition's impact upon physical and emotional well-being has been well documented. There is no cure for the condition, and no one treatment will work for every patient. Conventional treatments are geared towards treating the physical and psychological instabilities caused by the condition. Experimenting with different therapies ensures that each person with vitiligo will find what works best for them. Physical Treatments: Today, there are more treatment options available than ever before. Traditional therapies, including the PUVA system and steroid cream, are still being used with varying rates of success. Newer technologies such as narrow-band UVB, Pseudocatalase cream, excimer lasers, skin grafting and pigment transplantation, topical psoralens, immunomodulators, and nutritional supplementation coupled with UVA therapy, have proven extremely effective in a preliminary study. Emotional Therapy: Emotional treatments are focused primarily on patient support emotional support systems that influence the patient's ability to manage/cope with this condition. When used with light therapy, Callumae may help to restore the appearance of your skin. Research indicates that the ingredients found in Callumae can benefit all vitiligo sufferers, especially when combined with ultraviolet light therapies. Clinical trials have shown that many important vitamins are lacking in a large number of vitiligo patients, including Folic Acid, vitamin B6, and vitamin B12 - nutrients responsible for pigmentation, energy metabolism, and nervous system function. Callumae not only includes these vitamins in its unique formula but also employs a synergistic blend of potent botanicals for processes relating to immunological functioning and skin health. Picrohiza, another unique ingredient to Callumae, has a long tradition of use for immune dysfunction in Ayurvedic medicine. This may prove to be extremely beneficial for patients with vitiligo thought to have an autoimmune component. Callumae also addresses issues of oxidative stress with the inclusion of the potent antioxidants gingko biloba and lipoic acid. Finally, extract from khella (Ammi visnaga) may be useful in re pigmenting the skin of people with vitiligo. In fact, khellin, the active constituent in khella, may work as effectively as some psoralen drugs; stimulating repigmentation of the skin by increasing sensitivity of remaining melanocytes to sunlight. Regardless of your age, how widespread your vitiligo is, or what conventional treatment you currently use as part of your day-to-day treatment, Callumae can be used to compliment any existing therapies. Progressive Health's guarantee gives you confidence in knowing that your body will be provided with the most effective, comprehensive, and potent supplemental option for vitiligo treatment available today.